Movin' On is moving back a day! Movin' On, our Llandrindod based arm of Powys Youth Dance Company, is moving from Wednesday to Tuesday, and at a new earlier time of 5.45pm to 6.45pm. There are several potential performance platforms happening over the next few months, so if you're a young person who likes dancing and performing, then come along this evening to find out more. You can also pay for the term online here. Meet Us at the Barre? Dancing for pleasure is illegal in Iran. Hopefully the recent lifting of sanctions in Iran means that this might change in future. It's a reminder of how fortunate we are that we can dance. I recently attended an adult ballet class at our base, the Dance Centre in Llandrindod Wells. Led by Sara Poulson, who runs our in-house ballet school the hour long class is aimed at adults of any ability and experience as is only £4. Sara is adept at juggling the varied abilities, providing two versions of exercises to cater for all. With its emphasis on strengthening and lengthening muscles in limbs and core it's a great option for those whose dodgy joints makes cardio difficult! I had not expected the class to be such a stress-buster, but the gorgeous music, graceful movements (or attempts at!) and friendly group meant the hour flew by and I left feeling happy and energised. The class runs on Mondays weekly from 6.30pm to 7.30pm and you can just drop in. Hope to see you at the barre! 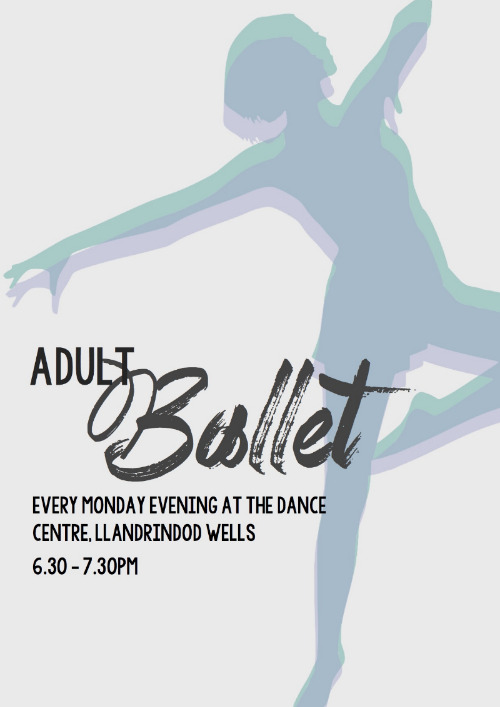 Adult ballet for all abilities.